Mirima Dawang Woorlab-gerring Language and Culture Centre (MDWg) is an Aboriginal organisation seeking to preserve and revitalise the Miriwoong language of the East Kimberley region of Western Australia. Our language revitalisation initiatives include a wide range of activities, such as an early childhood program, language classes, resource development, and bilingual radio programs, to name a few. 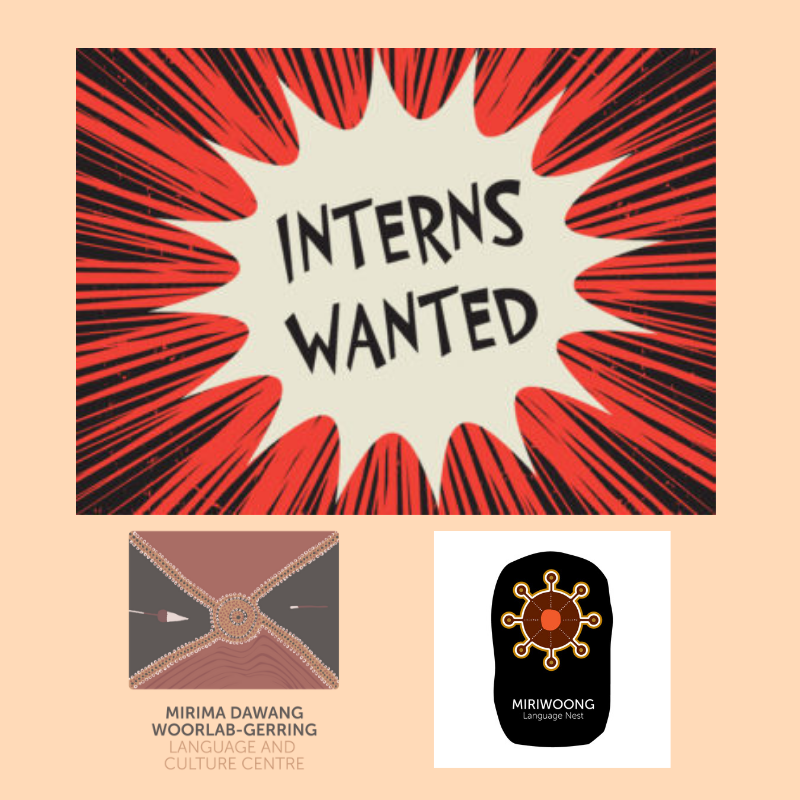 For the second half of 2019 we are offering two types of internships within the Miriwoong Language Nest, our early childhood language education program. Having a background in education (preferably language education), languages or linguistics would make you an ideal candidate for this role. 1. Our Language Nest Standard Internship program engages volunteers for a period of 10 or more weeks to assist the work of the Miriwoong Language Nest. Successful candidates will get insight into the typical operations of an immersion-based early childhood language program run by our team of Miriwoong women, as well as the training and administrative side of the project. This internship also offers insight into other areas of language revitalisation work. 2. The Language Nest Special Internship program aims at engaging a volunteer for a period of 6-12 months. Their focus will be on the support of our team of Miriwoong women who are engaged in our early childhood language program. Typical tasks involve different forms of training, such as lesson planning, pedagogical skills, and resource development. While MDWg is not in a position to pay any compensation, we have limited funds to subsidise the costs for accommodation. All interns are engaged as volunteers and their involvement does not constitute employment on any salary or wage. What we can offer is an unforgettable experience working with the local Miriwoong community, hands-on knowledge about the issues of language revitalisation. All internships require a WA Working with Children Check and National Police Clearance. MDWg is prepared to cover the cost for these applications. Applicants should have a background in languages, linguistics, education, Indigenous, or related fields, be open to working in a diverse cultural environment, and probably have some sense of adventure, including a tolerance to Kimberley temperatures. Past experience has shown that internships at MDWg can be competitive, as we prefer to have only one intern at a time for each category. In order to apply, please send us an expression of brief interest first, indicating what type of internship you are interested in and we will respond with a detailed description. You can contact Dr Knut J. Olawsky on info@mirima.org.au. Applications for the Language Nest Standard Internship are open until 22 February 2019. The closing for the Language Nest Special Internship is 28 February 2019.